The Sawtooth Trail, located in Tahoe National Forest in Truckee off USFS 06 (a.k.a. 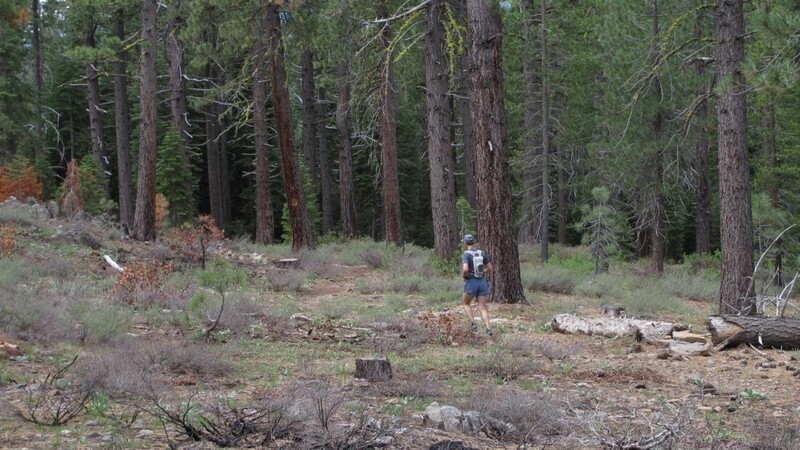 the Fiberboard Freeway), offers a forested Tahoe trail run close to town. The official Sawtooth Trail is a 9-mile lollipop route. I like to do a variation that is a full loop and about 9.3 miles. Either way, there is only minor elevation gain. Sawtooth Trail is a convenient escape during busy tourist times. Leave Downtown Truckee headed south/southeast on Brockway Rd. Turn right at the first light, Palisades Dr. Continue on the same road as it turns left and changes Ponderosa Dr. Turn right on Silverfir Dr, then left on Theilin Dr. The gate for USFS 06 is less than .25 miles on the right. Park outside the gate if it is still closed for Winter. Otherwise, drive .25 mile uphill on USFS 06 to the large dirt parking on the right. There is a map at the trailhead. Click here for an interactive map and GPS data for the Sawtooth Trail Loop route. Head west/southwest on the single track from the trailhead parking. The trail starts out quite rocky and twisty, but settles down after a while. 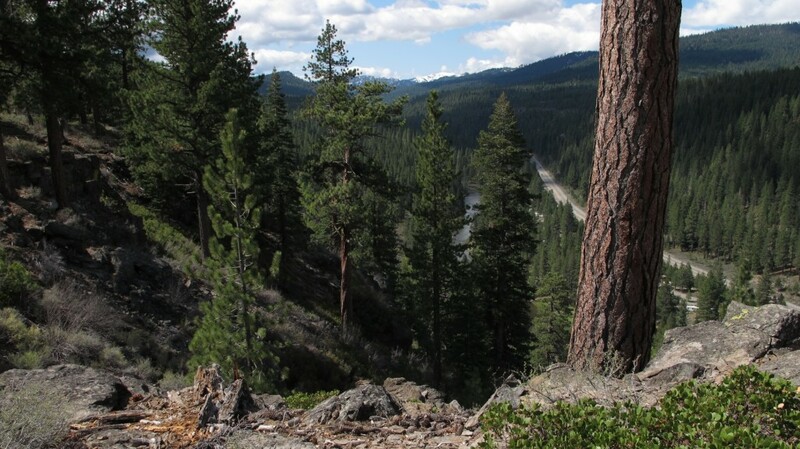 Enjoy a nice view of the Truckee River Canyon right at the first mile mark. When you reach a sign for “Sawtooth Trail / Sawtooth Road,” follow the arrow to the right to stay on the trail. Before mile 3.25 you’ll find a sign for the Viewpoint detour. The view is virtually identical to the previous clearing (pictured above), but check it out if you’d like to add .25 mile to your run. After the detour connects back to the primary trail, stay right on any forks in the single track. You return to USFS 06 dirt road about half way through the run; there is a map and trailhead sign here. Cross the road and continue on the single track. The route is a bit more difficult to follow on the second half of the run, as there are many unmarked intersections. Continue straight through any unmarked intersections with roads or single track. Then, at about mile 6.2 (mile 6.45 if you took the Viewpoint detour), you’ll hit a dirt road. Do not follow the sign to the left for “Sawtooth Trail.” (See variation below for the Sawtooth Trail Lollipop route.) Instead, take the road to the right a few yards and continue with the single track on your left. Here you continue a gentle climb on single track. After .5 miles running under the power lines, watch carefully for an unmarked single track to your left at about mile 7.5 (or mile 7.75 if you took the Viewpoint detour). Turn left and enjoy the cruise downhill to the trailhead parking, but watch carefully for forks in the trail. At the first (murky) fork, go right. Then, go left and downhill at the next two forks (i.e. ignore any trail that leads off uphill to the right). Mountain bike tracks on your path are a good indicator that you are still headed in the right direction. 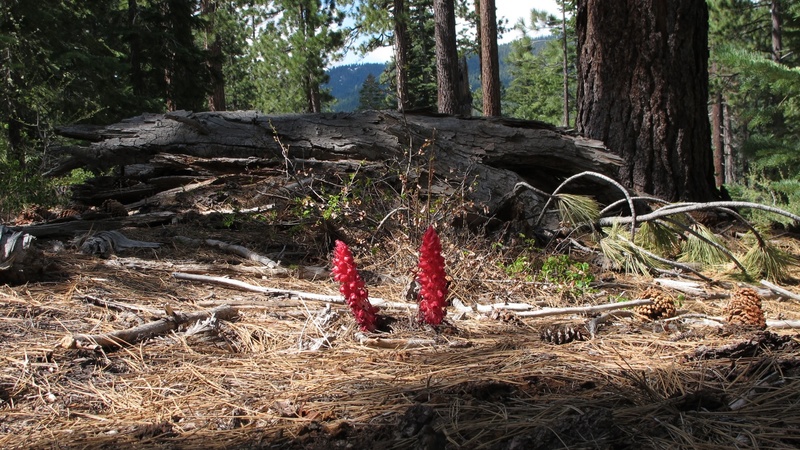 For a 9-mile lollipop that stays on the official trail, follow the sign for Sawtooth Trail at mile 6.2 and cross back to the first part of the trail, as shown on Truckee Trails Foundation’s website. Do a 6.75-mile out-and-back with the Viewpoint detour as your goal. When you return to the main trail from the Viewpoint, turn left and go back the way you came. While USFS 06 is generally an unpleasant surface for running, it can be a fun change of scenery with a couple inches of snow on the ground. Practice the footprints in the snow exercise or run it with snowshoes. Enjoy your run, and please leave a reply below if you have questions or corrections! Very rocky for most of the trail, almost to the point of not being able to enjoy the scenery because one has to stay highly focused on the ground. Also, not very well marked and the directions given are very necessary. On a hot day, there was plenty of tree coverage though. I’d recommend for a long run as there are ways to lengthen or ease back on distance. Thanks so much for the note. I haven’t been over to Sawtooth in quite a while!